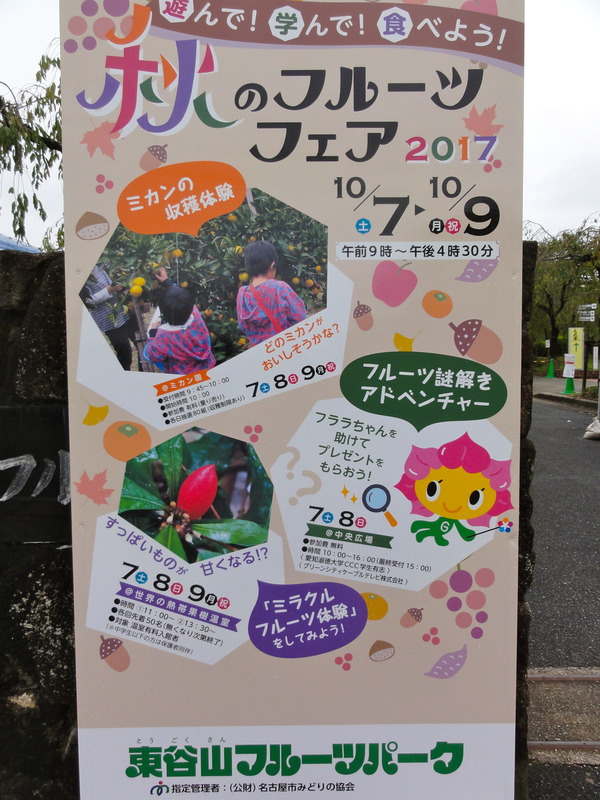 2017/10/9〜11 Autumn Fruit Fair in Togokusan. The most polular fruit shop in this Fair. University hawaian dance show. Nagoya City Fire department music band. Handmade beetle toy. Big bear-bee. 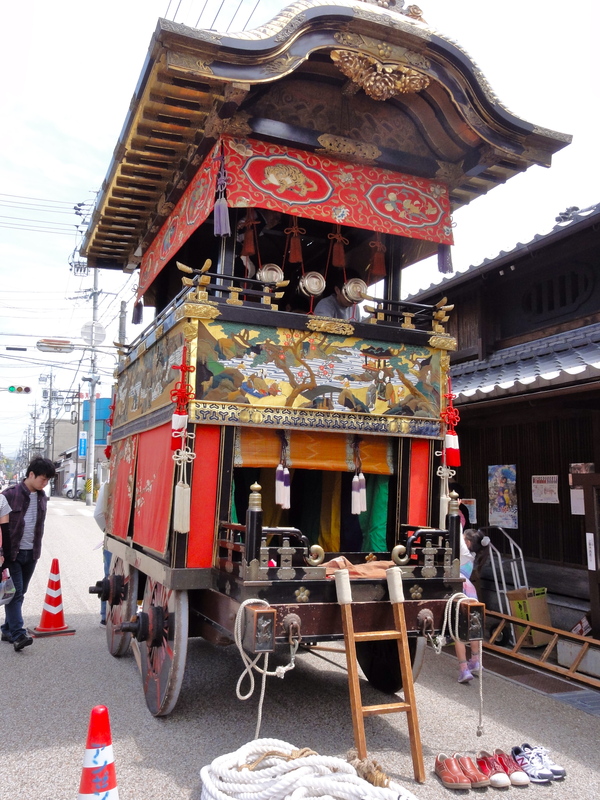 IGA Ninja Festa is held in IGA city Mie prefecture 2nd Apr.to 5th May.2016. Its Event consists of 4 parts. 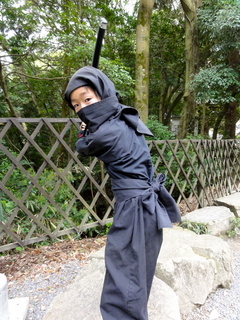 �@Change the uniform of Ninja. 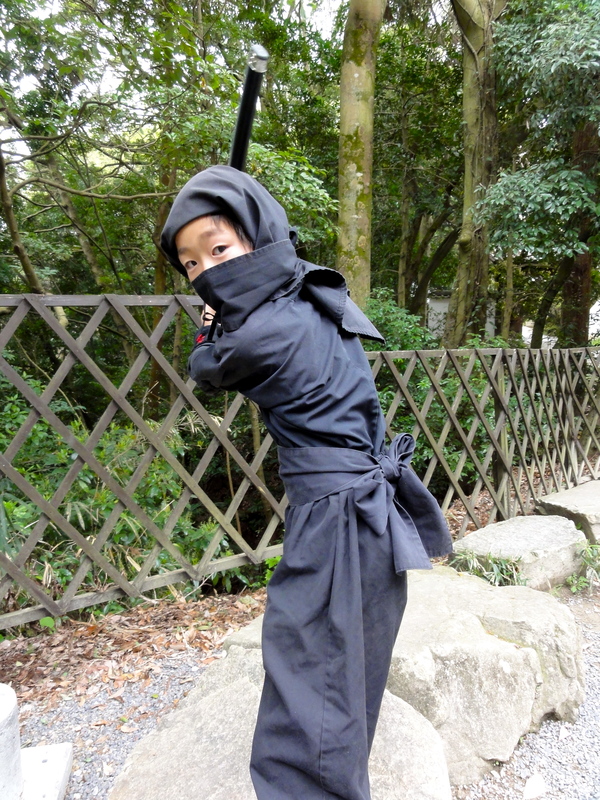 �AExercise Ninja special test in the town. �BSpecial Event news for the season of IGA Ninja Festa. �CCosplay in IGA Country at Spring Season. It's a sweet, biscuit coating by chocolate creme. Nice for tea time,cocoa,tea and coffee. "GONGITSUNE"story is a famous fairy tale here in Japan.It is written in the junior school's the forth graduate Japanese language text book. It's story was written by Nankichi Niimi(real name was Shohachi Niimi). Visitor is able to in and see in the museum at 9:30-17:30 closing time. The architecture is wonderful for the view and very unique for it outside. The times we take to look around to most of the museum is almost 45minutes. Souvenir is many kinds,so you should take some times to consider to choose. Traffic access is very easy using the hight-way root. In this area,real natural fox are found in the recent years. Travelers should take more time to look around not only this museum but also more memorial places. Chubu Central Air Port,Tokoname(china craft maker gathering),Mentai Park. Himakajima(Himaka Island),Shinojima ( Shino Island),Chita Meat(Beef). Have you ever try shrine lot? you can take english version shrine lot. Why don't you try to it? Spending only 100yen to choose it. Hoping you that good fortune inside,devils outside. Kushitaro placed at Hansobo near by Yagoto square in Nagoya city is very familiar with us.All of the prices is agreeable and economical.For instance each piece of Kushi is almost \100. Price of \1000 course including following items,2 mugs of beer,2pieces of kushi and 1 dish of salad. A photograph of this time show a Buta (Pork) kushi. Location of this shop is very easy to find out. SUZUKAGAWA is made in Ise area where situated in MIE prefecture. At the first time when you taste it, you can feel in your mouse full of the flower's smell. And it's taste in the mouse is very different from regular Japanese Sake. I think most of the lady are able to drink it more easily. You can drink,you will say it's good copy for your close friend. I trust,so let's try it! The Fourth Kushitaro Hansobo shop close to Yagoto in Nagoya. Recently it shop was opened only 4 days before. We have come to there 17:30 on 28 May 2013. It was the first customers then. We recognized it is the fourth owners shop. there are so good selected menu for us. Kushikatu and one plate of salad. ginger soi sauce was only \150. price is not so expensive just like from \350 to \500. compare with ancient owner's shop. There are two ways how to cook the chicken lever in my house. Traditionary our family use the lever to boil or to toast. We always use soy sauce mainly,a little bit of sugar,sliced ginger and a pinch of salt after boiled by hot water. Next job is only to mix those spices and sauces in the pot, and boil it for 30 minutes. This one is available to keep in a refrigerator for a week. 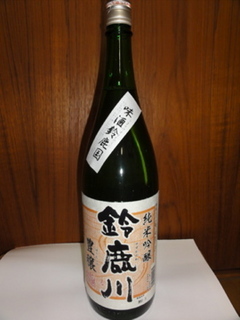 The taste is gradually changes to unique and sweet. I prefer to eat this one two or three days after the cooking. Prepare some job for the cooking. Very simple working ,at the first time,only to soak lever in soy sauce. At least after soaking 30 minutes,cooking it in the gas toaster. Please attention,too toast it is not so good for taste,so look it some times does it nice roasting or not. 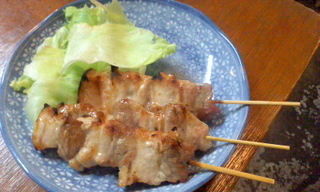 Yakitori,it's my favorite foods,nice for Beer,Shothu,and Japanese Sake. 5,Nov.2012 we went to Ebisuya Yakitori shop at Gokiso in Nagoya through subway. Each kinds of yakitori should be ordered at least three pieces for one . At the first time we ordered rare beer,it arrived as a pitcher style holding brand Ebisu. It is very similar to the shop's name. Prices of yakitori is \120 on the average,and we very wellcomed to so many kind of Shothu. 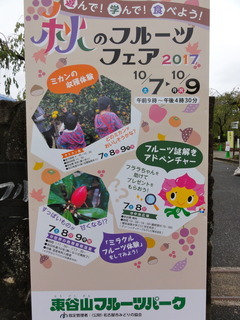 Site:walking from Gokiso subway station to the Ebisuya,it takes 8 minutes. Taste:a little bit deep taste for the Tokai area's people,on the other hand,it seems to me that this shop's taste much for the most of the outsideworkers. Yakitori:"Funachu" Motosumiyoshi ST. Tokyu Toyoko Line. I returned to my hotel which situated the next station of Hiyoshi,Tokyu Toyoko line. useful for translate to Shinkansen. Business Hotel Sugata is very very close to the Motosumiyoshi station,and the price is economy for our busuness man. It's only taking one minutes to Yakitori House(Shop)from the Hotel. The stuff is only two,but the attitude to the customers is very sincere,I think. And also almost the prices is very economy,for example,all of its are \90(include the tax).The taste is very good and I feel some kind of handmaking. So let's enjoy the Yakitori in the shop of "Funachu",Motosumiyoshi station of Tokyu Toyoko Line. Two type of Unagi taste in Japan. Here in Japan,there are two type of taste of Unagi(broiled eals). and the later it is cooked by fired in these area. Unagi is fired at the first step. I prefer the second type of Osaka. We call this cooking style as Kansai Fu. Tsu city in Mie Prefecture,pronounciation of it is "Tsu-u:" deferent from "Tsu". But nowadays there are also famous city for eat the Unagi in restaurant. From Tsu to Sakakibara Spa,we have 40minutes by car. So nice and delicious lanch is avairable to eat easily. Please get its notice via net :Kawahachi has its HP. Gyoza,Shumai, Gyoza and Shumai as Nagoya eating food as favorite. Gyoza and Shumai in Gyoza and Shumai in Nagoya. As you may know,there are favorite food as souvinir in YOKOHAMA as Kiyoken's shumai.Here in Nagoya,we can find there are Kotobukiya's gyoza and shumai. Very economical price and get it easy near station of Kintetsu Line or Meitetsu Line of Nagoya.Why don't you try it ? And olso this is my third opinion . Kotobukiya has onother goods for eating with drink beer. Kushikatsu is much better for beer. Please try this when you have a chance.